The firm is led by five owners—Jim Olson, Tom Kundig, Kirsten R. Murray, Alan Maskin, and Kevin Kudo-King—who are supported by eleven principals, fifteen associates, and a staff of approximately 140 in the historic Pioneer Square neighborhood of downtown Seattle. The firm opened a workspace in New York in 2014 to better serve its expanding roster of East Coast and international clients. The in-house interiors studio, founded in 2000, provides a full range of services, including material selection, custom furniture design, and purchasing capabilities. The landscape design studio provides in-house design services dedicated to artfully integrating nature and the built environment. The firm began its creative existence in 1966 with the architect Jim Olson, whose work at that time centered on explorations of the relationship between dwellings and the landscapes they inhabit. Olson started the firm based on the essential ideas that buildings can serve as a bridge between nature, culture, histories, and people, and that inspiring surroundings have a positive effect on people’s lives. Over the five decades of its existence, the firm has grown and broadened its expertise far beyond the residences for which it is still best known. It consciously devotes a consistent energy and enthusiasm to every project, no matter whether the task at hand is a cabin in the woods or a high-rise in Seoul. Every finished project manifests a “macro to micro” level of attention, from the big ideas to the smallest details, giving coherence to the entire experience of the built site. 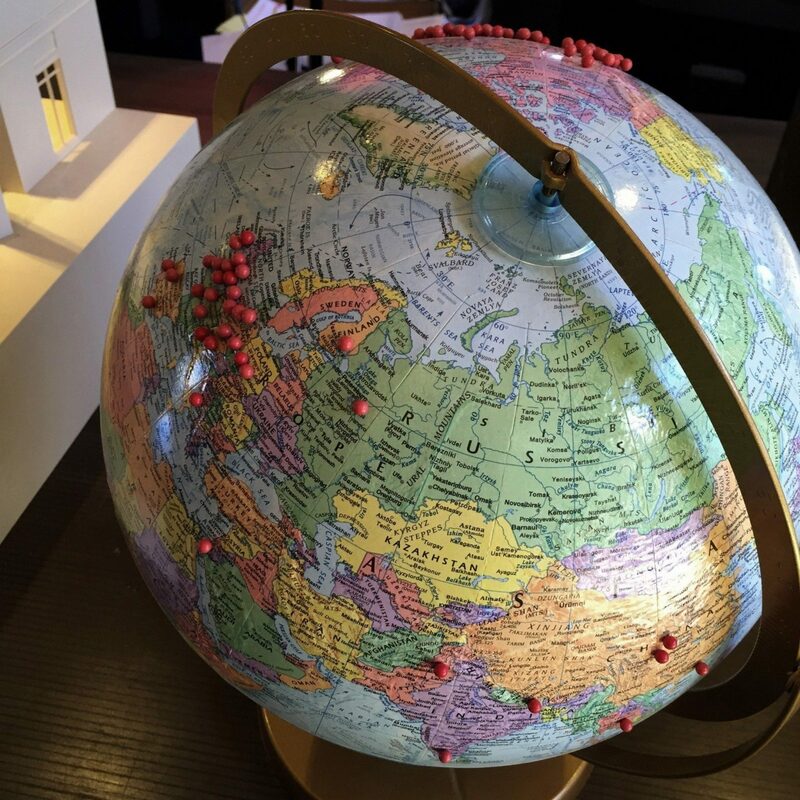 The geographical scope of the work has grown to cover more than fifteen countries on five continents, in locations ranging from the rural landscapes of Montana and Idaho to dense urban contexts in Manhattan and Mumbai. 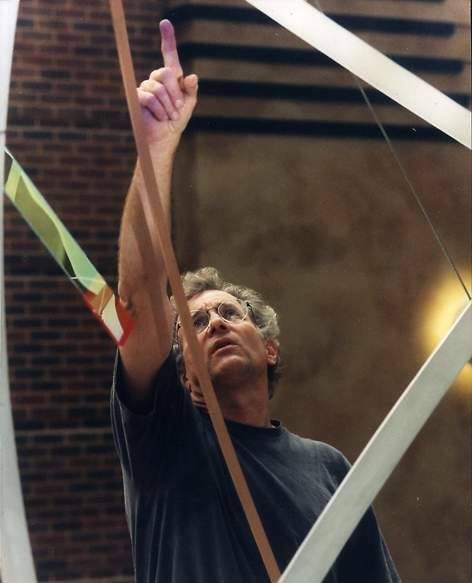 But no matter the situation, the same philosophies—for instance a careful consideration of the environment, attunement to local materials and culture, and seeking out the expertise and contributions of craftspeople, artists, and other outside experts—continue to apply to each new undertaking. 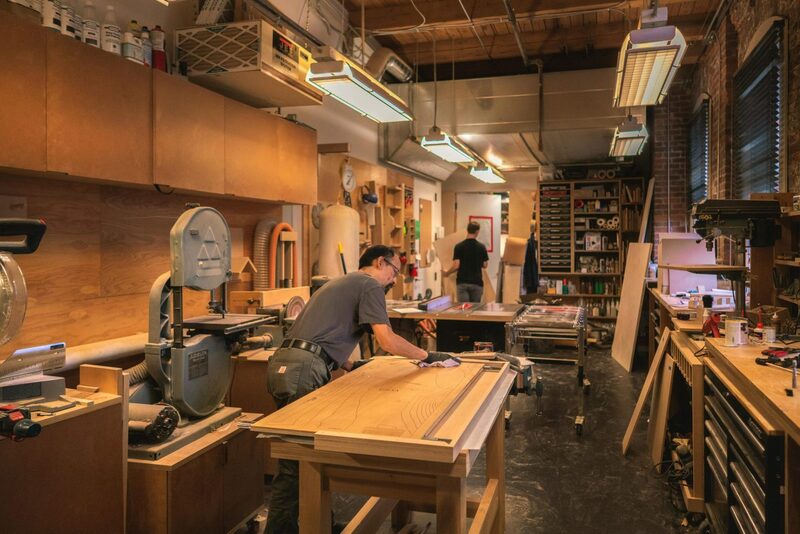 Working with artists and craftspeople is integral at Olson Kundig. In some cases, the architecture becomes the vessel that supports specific art installations. In others, the architecture and art are formed together to create a seamless spatial experience. In nearly all of its projects, the firm works with craftspeople to fabricate specific elements that support the larger intent. Frequently, evidence of a maker’s hand will remain explicit and embedded throughout a project; perhaps a steel worker’s grind marks will be visible on a metal rail, or the rough edges of a sawn wood piece will be left exposed. 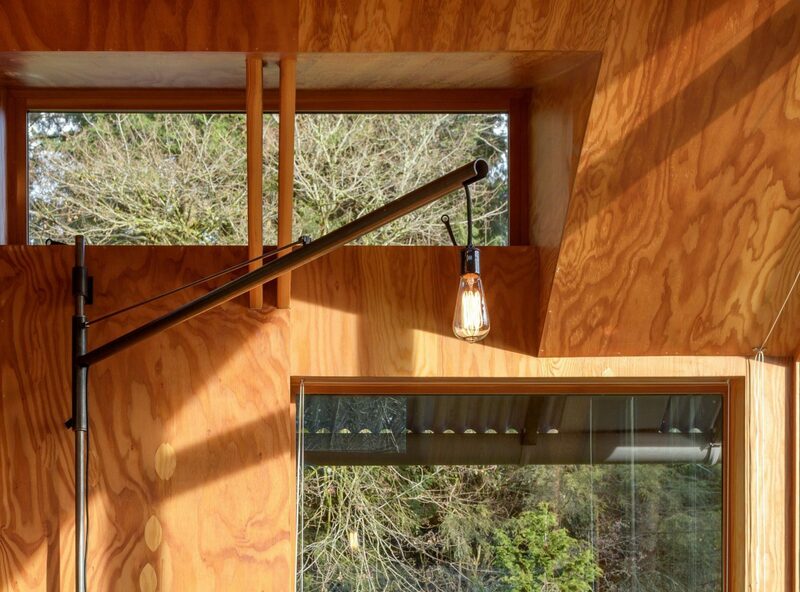 This valuing of craft has its origin in part in the firm’s location in the Pacific Northwest, and also in its understanding of buildings as collaborative efforts that involve not just the architect, but the contractor and the workers as well. The emphasis on craft is an outgrowth of Olson Kundig’s contextual approach to design, as working with artists and craftspeople local to our projects around the world helps the work tell an authentic story of its place. 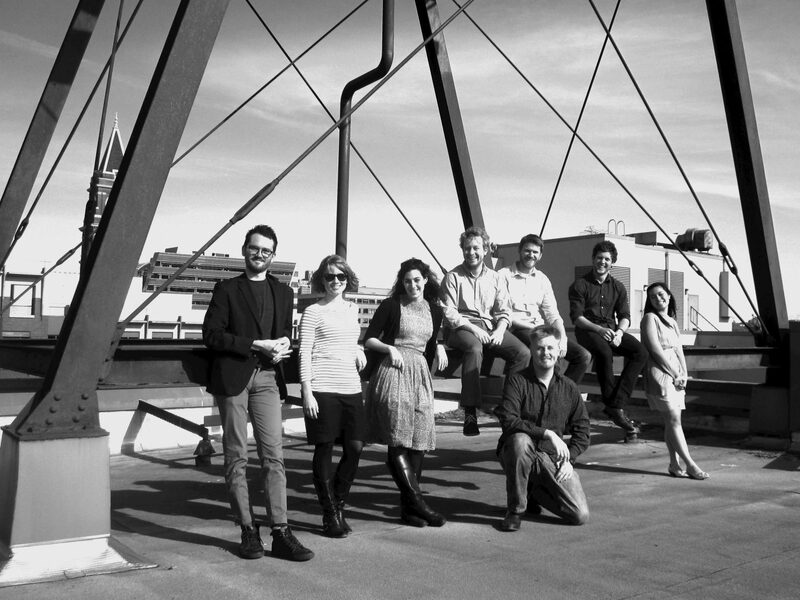 At Olson Kundig, we believe that world-class design and building performance are intrinsically connected. Our humanistic approach to sustainable design acknowledges that performance is driven by people, place and program. By blurring the boundaries between inside and outside, our buildings connect people to nature, leading to healthy and productive environments where individuals are engaged in their surroundings. Our architecture reminds people that they are deeply intertwined with the environment, even when they are inside. The architectural staff approaches building performance with an intuitive sensibility, employing advanced software tools to test and challenge this intuition. We use a wide variety of analytical tools at various stages of the design process to understand a building’s energy use, thermal comfort, materials impact, natural ventilation, daylight management and a host of other performance considerations. Vikram Sami, our director of building performance, works closely with design teams to ensure that performance strategies inform the design process from a project’s inception. As a demonstration of our leadership within the building industry, we have joined the AIA 2030 Commitment and actively incorporate national sustainability standards including LEED®, WELL Building and Passivhaus into our designs. 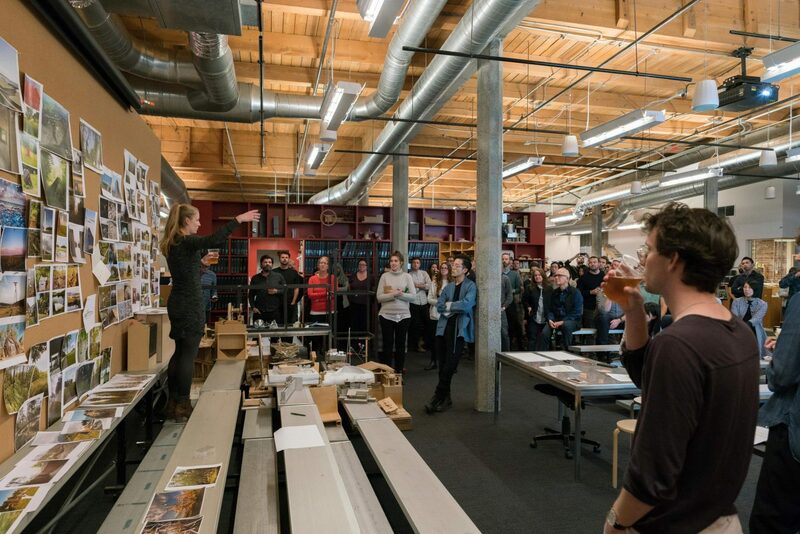 Olson Kundig’s studio is located in a 19th-century brick manufacturing building in the historic neighborhood of Seattle’s Pioneer Square. Over the years, the Washington Shoe Building has served as our platform for experimentation, from hosting our [storefront] project in an empty ground-floor retail space, to undertaking research on the Fifth Façade Project, a conceptual design that links all of the rooftops of the neighborhood’s buildings. Since taking residence in 2003, we have morphed and expanded our own footprint inside the building where our staff of 175 inhabits the top three floors. Every Thursday since the inception of the firm more than five decades ago, the entire staff turns off their computers, puts down their pencils, and convenes to discuss an ongoing project. 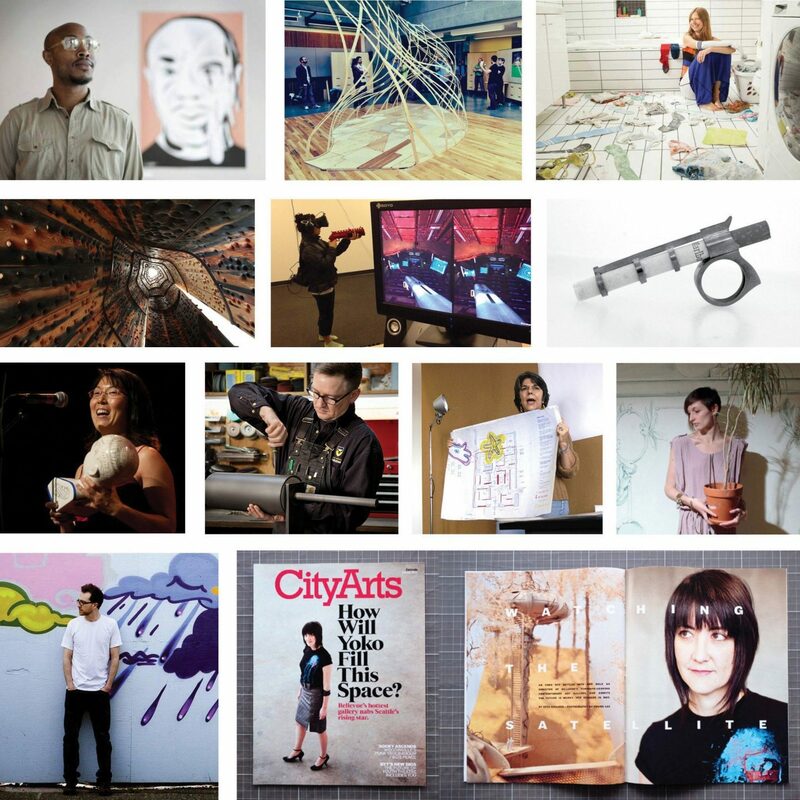 “Thursday Crit” is more than just a weekly activity for us. It symbolizes the culture of design dialogue and experimentation that defines Olson Kundig. In working together, we seek to make every project in the office the best it can be. 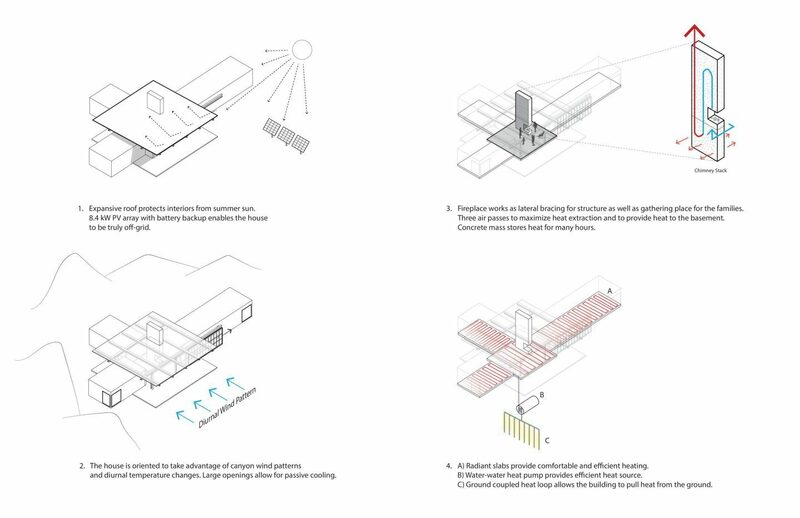 Reciprocal learning is a key tenet of Olson Kundig’s culture. In 1996, Kirsten Murray and Alan Maskin co-founded the firm’s International Internship Program on this principle. The program provides six-month positions to students and recent architecture graduates from around the world, offering mentorship and experience on actual projects; in exchange, each intern presents to the office on a topic of their choice, enriching us with their knowledge and life experiences. 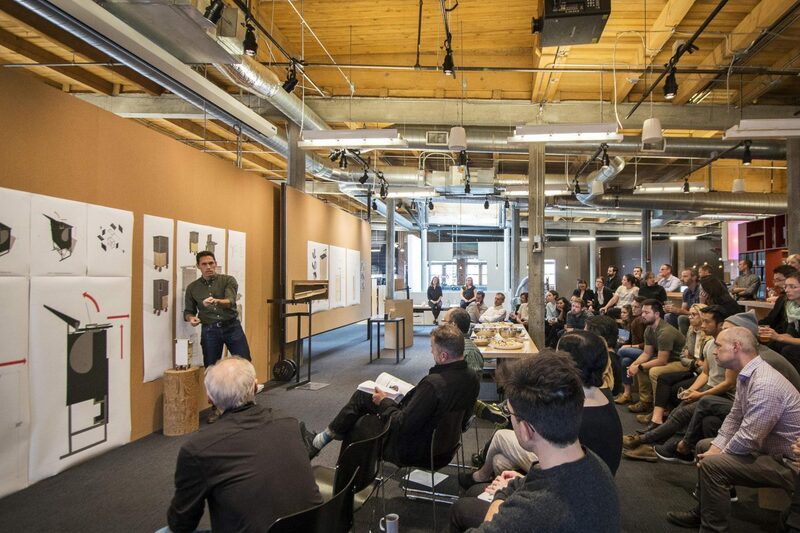 To date, Olson Kundig has hosted interns from more than 30 countries around the world, and every state in the U.S.
Every Monday, Olson Kundig starts the week with an all-office meeting. Three times a month, the meeting is devoted to speaker presentations, often by outside guest speakers. 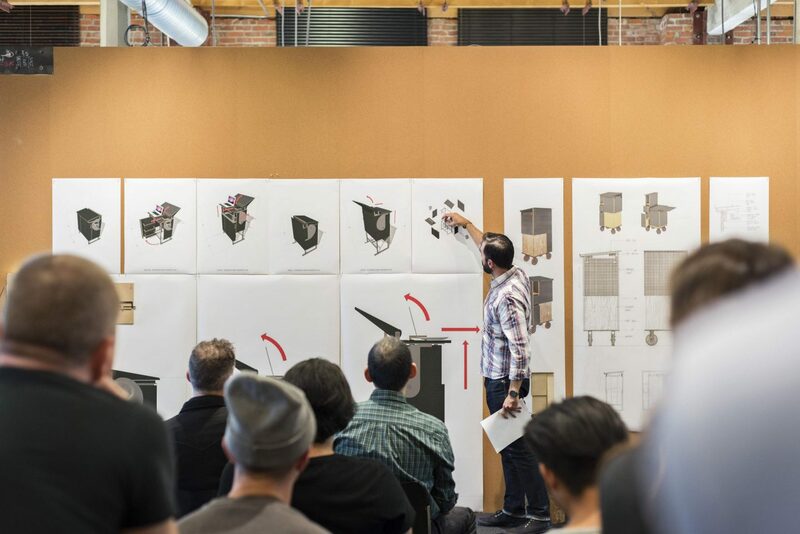 The Olson Kundig Speaker Series was created by Alan Maskin over two decades ago with the goal of inspiring staff with presentations from people who work outside the realm of architecture. To date, more than 280 guests have come to speak in our offices. The forum is also available for internal speakers, who share completed project overviews, complex project details, and research findings, all with the aim of increasing our shared knowledge. Olson Kundig defines research and development as “little r, big D,” meaning that our research efforts are focused on developing ideas into built projects. Realizing that compelling ideas often emerge from both within and outside the framework of the firm, artists, craftspeople, contractors and consultants are regularly invited to participate in design discussions. Our recently expanded shop and maker space provides resources for staff to build models, prototype ideas and test materials. OK Works regularly sponsors workshops and in-house design competitions. Since 2016, Olson Kundig has offered staff a Travel Fellowship program which funds one week of travel and research anywhere in the world. No topic is off limits, and the fellowship encourages staff to seek out and explore self-guided, personally meaningful research topics where the knowledge gained will benefit the firm’s larger practice. So far, staff have traveled to Italy to study the ruins of fascist Rome, England to study furniture making, Austria to learn traditional earthwork techniques, Namibia to photograph light and memory, Japan to study nothingness, and the Czech Republic to study a 13th-century bone church. In 2016, Olson Kundig hosted our first Creative Exchange Resident, Robin Frohardt. Robin spent several weeks in our office where she developed elements of her installation and performance art. 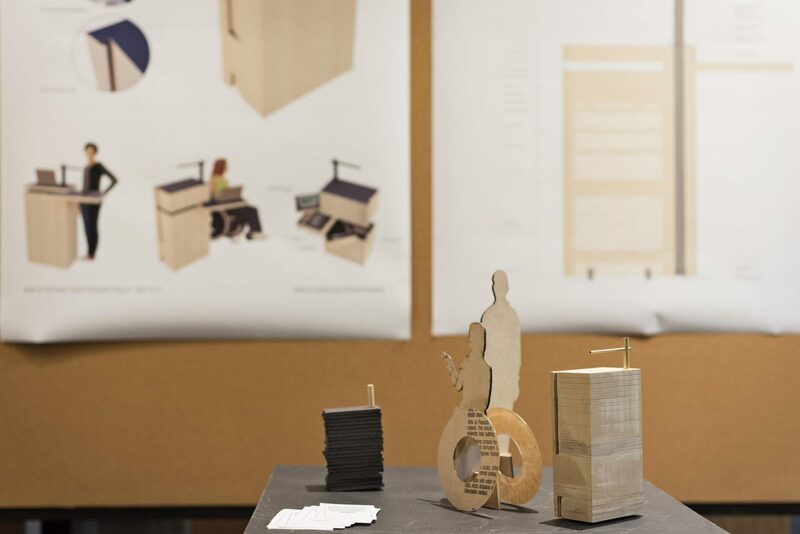 Throughout her residency, Robin offered opportunities for collaboration involving the entire firm, and her project was the subject of several Thursday Crits. 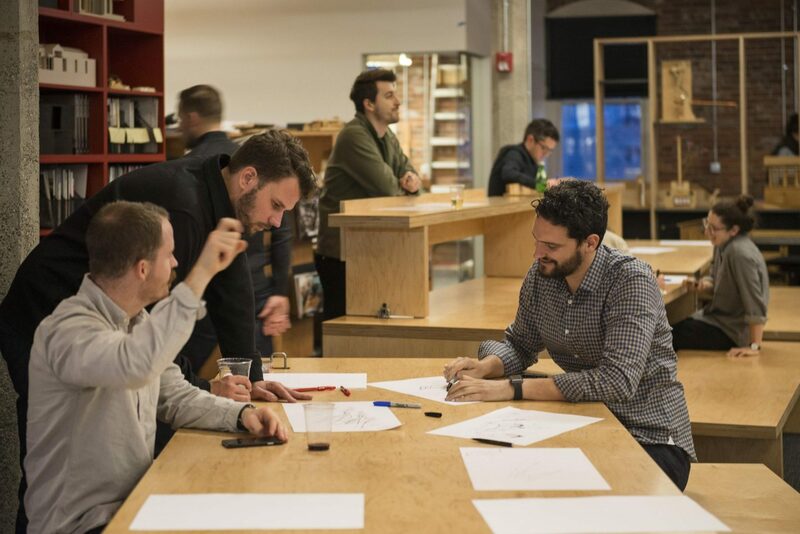 Designed to foster dialogue and inject the firm with fresh creative energy, the Creative Exchange Residency Program provides artist residents with a monetary grant and dedicated workspace in our office to develop their work. Our traditions of design mentorship and hands-on fabrication extend to the youth in our community. We believe that introducing kids to design early on empowers them to actively shape the communities where they live. We have a longstanding mentorship partnership with Sawhorse Revolution, a local non-profit organization that teaches teens carpentry and design through inspiring community projects. We have also participated in design mentorship programs including Seattle Art Museum’s Design Your [Neighbor]Hood, the ACE Mentorship Program, Opportunity Skyway, and the Partnership for Youth program coordinated by the Frye Art Museum and the Associated Recreation Council at Yesler Community Center. Our staff also regularly serve on design juries and teach studios for architecture programs at local universities. Among the firm’s accolades are the 2009 National AIA Architecture Firm Award (as Olson Sundberg Kundig Allen Architects); dozens of national and regional design awards from the American Institute of Architects and the International Interior Design Association; American Architecture Awards from the Chicago Athenaeum; Jim Olson’s 2007 Seattle Medal of Honor; and Tom Kundig’s National Design Award from the Smithsonian Cooper-Hewitt and his Academy Award in Architecture from the American Academy of Arts and Letters. 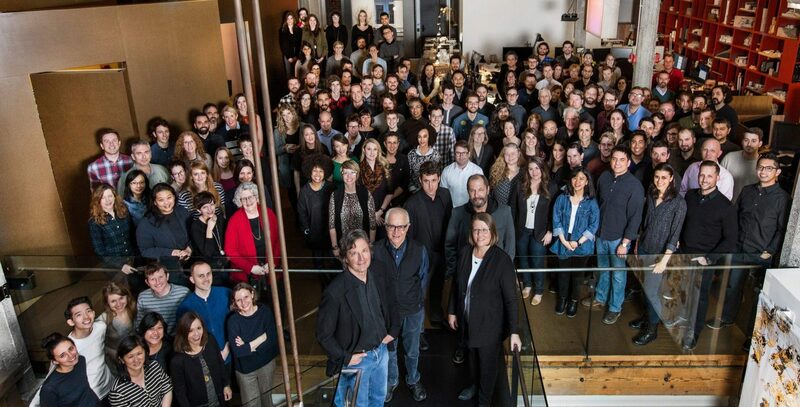 Olson and Kundig were inducted into the Interior Design Hall of Fame in 2012 and named to the AD 100 in 2016. For two years in a row, the firm was named one of the Top Ten Most Innovative Companies in Architecture by Fast Company. The firm’s award-winning work has been widely exhibited and published, including in the New York Times, the Wall Street Journal, Wallpaper*, Financial Times, Architectural Digest, ARCHITECT, and Architectural Record, and it has been featured numerous times on the covers of books and magazines.